""How Do You Like It?"" ""When I Give My Love""
Get Up On It is the fourth studio album by the American R&B recording artist Keith Sweat. Released on June 28, 1994, it went to #1 on the R&B Albums chart for two weeks and #8 on the Billboard 200 chart. Singles from the album include the lead-off single "How Do You Like It? ", the title track and "When I Give My Love" - overall were Top 30 R&B hits. The album features collaborations from the late Left Eye of TLC, Roger Troutman of Zapp and up and coming group Kut Klose, which features Athena Cage. On December 6, 1994, Get Up on It was certified platinum by the Recording Industry Association of America, for shipments of one million copies in the United States. ^ a b Tucker, Ken (July 15, 1994). Get Up on It | News | EW.com. Entertainment Weekly. Retrieved on April 18, 2011. ^ Promis, Jose F. (August 1, 2003). Get Up on It - Keith Sweat. Allmusic. Retrieved on April 18, 2011. ^ Johnson, Connie (June 26, 1994). "(**) KEITH SWEAT, "Get Up on It"; Elektra". Los Angeles Times: 62. Retrieved April 18, 2011. ^ RIAA - Gold & Platinum: Keith Sweat. Recording Industry Association of America. Retrieved on April 18, 2011. ^ "Dutchcharts.nl – Keith Sweat – Get Up on It" (in Dutch). Hung Medien. Retrieved November 4, 2013. ^ "Longplay-Chartverfolgung at Musicline" (in German). Musicline.de. Phononet GmbH. Retrieved November 4, 2013. 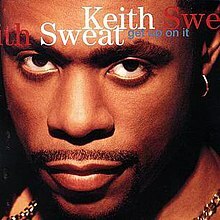 ^ "Swedishcharts.com – Keith Sweat – Get Up on It". Hung Medien. Retrieved November 4, 2013. ^ "Keith Sweat | Artist | Official Charts". UK Albums Chart. Retrieved November 4, 2013. ^ "Keith Sweat Chart History (Billboard 200)". Billboard. Retrieved November 4, 2013. ^ "Keith Sweat Chart History (Top R&B/Hip-Hop Albums)". Billboard. Retrieved November 4, 2013. "I'll Give All My Love to You"
"I'll Trade (A Million Bucks)"
"(There You Go) Tellin' Me No Again"
This page was last edited on 17 October 2018, at 22:02 (UTC).